In FAST - Racing League it's the year 2112 and the masses are fascinated by extreme high-speed races. The latest antigravity racing technology introduced phase-shifting. Perfectly phase-matching tracks and racing machines is the key to survival. Prepare yourself for a whole new racing experience at breakneck speeds. Push your skills to the limit to win races and beat records. Challenge your friends to an all-out split-screen competition. Compete against ruthless opponents and race to the top of all leagues. Warm up your engines – the future is now. 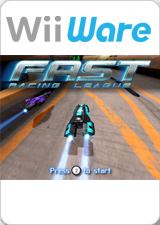 Fast - Racing League features a setting called "Variable Framerate" which lets the game run as fast as it can instead of locking to 30 FPS. If you turn this setting on and Overclock Dolphin's Emulated CPU Clockrate, the game will run at 60 FPS without any framedrops. The graph below charts the compatibility with FAST - Racing League since Dolphin's 2.0 release, listing revisions only where a compatibility change occurred. 3.5-413 Windows XP AMD Athlon II X2 215 @ 3.56GHz NVIDIA GeForce 440 Qualfication at full speed (50FPS), if used LLE - no big sound issues (if use HLE and press TAB - get upto 90FPS). But next in game - not enough speed (28-39FPS), shuttering sound (HLE & LLE). †.fl.l). This page was last edited on 5 January 2017, at 08:39.